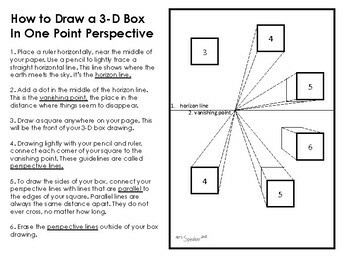 Step by step instructions on how to draw a box in one point perspective with vocabulary words horizon line, vanishing point, perspective lines and parallel. Supplies needed to follow directions are are paper, pencil, eraser and ruler. Usually my middle school students need one or two 40 minute art classes to practice before moving on to more creative perspective projects. Ohio Visual Art Standards for "producing and performing"
7th grade: 3PR Represent depth and volume in their two-dimensional works of art.